Visual SceneMaker is an authoring tool for creating interactive presentations aimed to non-programming experts. It supports the modeling of verbal and non-verbal behavior of Virtual Characters and robots. Therefore, it provides users with a graphical interface and a simple scripting language that allows them to create rich and compelling content. SceneMaker’s central authoring paradigm is the separation of content (e.g. What a character should say and how) and logic (e.g. reaction to user input and/or internal processes). The content is organized as a collection of Scenes which are specified in a multi-modal scenescript resembling a movie script with dialogue utterances and stage directions for controlling gestures, postures, and facial expressions. 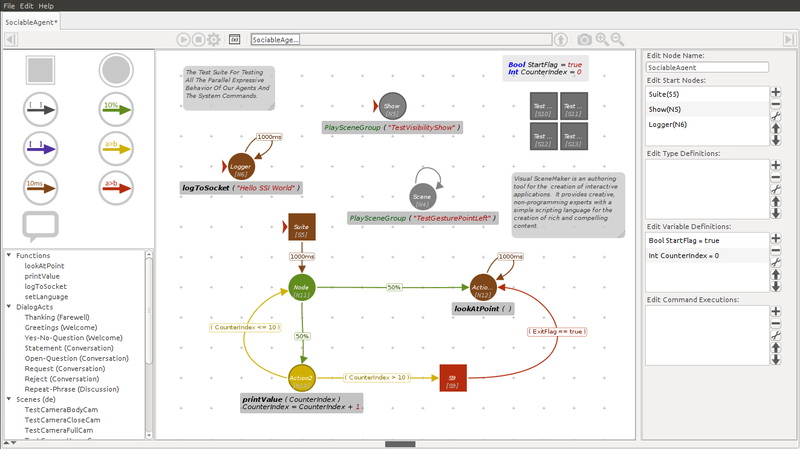 The logic of an interactive performance and the interaction with virtual characters is controlled by a Sceneflow, which is a nested graph similar to Harel's statecharts. The implementation of Visual SceneMaker relies on an interpreter approach, allowing real-time visualization of running Sceneflows and Scenes. Visual SceneMaker has successfully been used in several applications and in field tests with school students and college students proving that it can be a useful educational tool. Visual SceneMaker — A tool for authoring interactive virtual characters.